The Smoker Craft Pro Angler is a fishing boat that carries almost as much heritage in its name as the Smoker Craft brand does. Started by Byron Smoker, the First Family of Fishing is still running the company today and the Smoker Family passes these values into every boat they build. Designed for the dedicated fisherman who is looking for the major features like rod storage and a live-well but doesn’t need the bells and whistles that drive costs up, the Pro Angler lineup delivers exactly that. With 8 Pro Anglers in the lineup, the 172 sits closer to the top with only the 172 XL and 182 XL above it. Below it there are 161, and 162 models, available in both side and dual console layouts. The dual console 172 that I tested has an overall length of 16-feet 8-inches and a beam of 92 inches. The difference between that and the 172 XL is that the XL has a wide beam, wider transom along with a higher transom and more interior depth. What this extras gives you is the capacity for more people, which means our 172 has a 5 person capacity compared to the 7 of the 172 XL. So if you’re a one or two man wolfpack then the 172 is the boat for you. 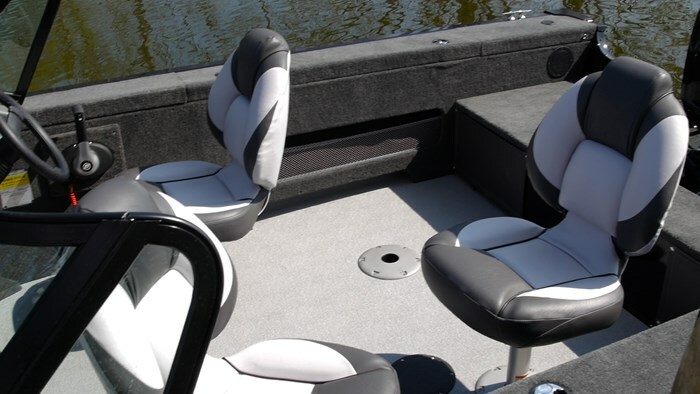 The 172 comes standard with 3 fishing seats and 6 seat bases so you can customize your layout to fit your fishing style. There is lots of room in the cockpit for when you’re driving at speed but when you’re stopped and you want to put them up on the bow and stern casting decks then you can easily do so. Something that is not commonly known is that Smoker Craft builds all of their seats in house rather than ordering them in. They do all of the vinyl stitching in their upholstery shop which means they can cover them under their Lifetime+6 Warranty - the best warranty in the segment. If more seating is important to you, or maybe you’re going to want to take the kids skiing or tubing then there is an optional flip down rear bench seat available. What I like about this is that it also extends your casting deck when you’re in fishing mode so it serves dual purpose. Rod storage is important and the 172 has 6-foot rod storage in the portside gunnels and storage for broken down rods in the starboard gunnels. There are two things I like about the gunnel rod storage in the 172. First is they they, along with the other storage compartments, lock. Not many fishing boats in the value, 17-foot segment have locking storage in all of their compartments. Smoker craft knows your gear is expensive and wants to make sure it’s protected so they include locks. 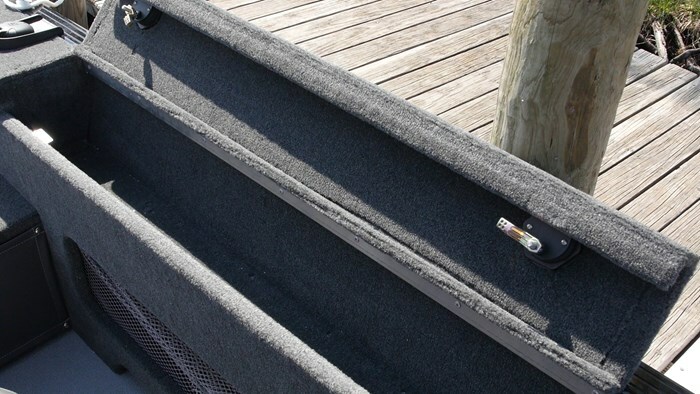 The second is that the additional storage gives you a wider gunnel that you can use as a step to get in and out of the boat depending on where you will dock your boat. Fishing boats aren’t always the easiest to get in and out of so it’s nice to see this touch. For your tackle and other gear there is storage under both of the consoles where you can toss larger items like your tackle bags but when you want quick access for things like plyers or your plano boxes there is netted storage in both of the gunnels. Toss items in here on the fly and they’re tucked out of the way and off of the floor. Both of the consoles are clean and stylish. 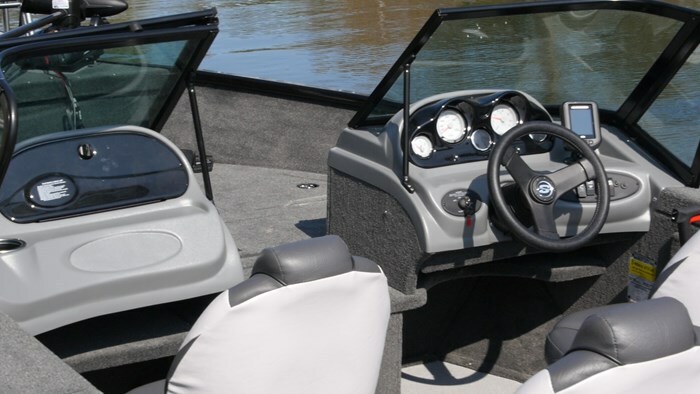 The port console has a very deep glove box that could even fit light jackets and the helm features a full gauge package along with your rocker switches. The boat I tested had a standard Humminbird depth finder mounted but there is definitely room for larger, more serious graphs. 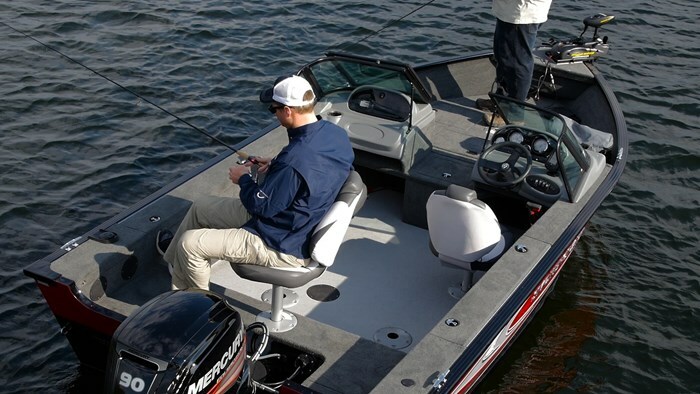 The money you save on this boat will allow you to go get that Lowrance touch screen you have been eyeing up. 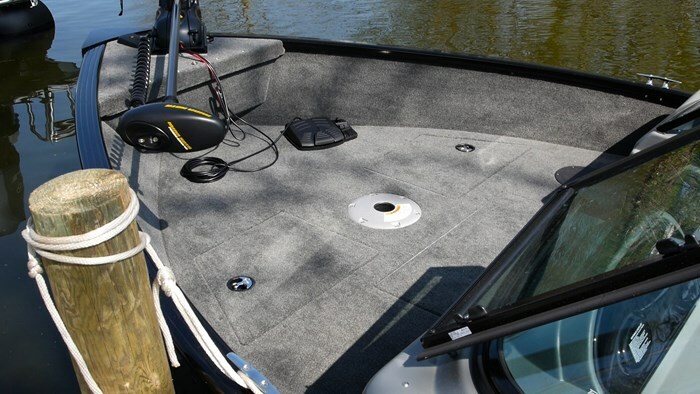 Up in the bow there is plenty of space for when you have the fishing seat up there, and on each side of that seat base you will find opening hatches that lead to one, large storage compartment. And yes these ones lock also. The 172 also features one of the largest live-wells in the segment as it has a 25-gallon bow livewell so the size of your boat isn’t going to limit the size of your catch. New for 2017 is a brand new colour scheme for the Pro Angler line. This 172 had red and black deck sides with a black hull and stylish vinyl graphics. This adds a very classy and contemporary look while remaining sporty while out on the water. Speaking of which I had almost perfect conditions to test this boat out. There was a very light, crisp breeze out of the South, with clear skies and a bright sun. This wasn’t the best representation of what type of conditions the 172 can handle, but I sure wasn’t going to argue with it. The Pro Angler sits on Smoker Craft’s legendary Hydra Lift Hull which features a reverse chine, 5 running keels under the boat and an integrated stringer system for a more solid feel. When I put the throttle to the 90-hp Mercury Outboard down the bow of the 172 popped up and almost immediately dropped as it was on plane in just over 2 seconds. Add a second or third person and this will obviously slow down a bit, but it’s a great start. That’s those reverse chines going to work as they create the lift to get the 172 up on plane so quickly and will continue to work when you add more weight into the boat. Having test drove many Smoker Crafts in the past, when they say the 5 keels help with straight line tracking, they are right. The Hydra Lift Hull is one of the best tracking hulls I have driven, not only in calm water, but when it gets rough as well. I found a rougher spot on the lake and was taking the chop broadside on the starboard side and the 172 didn’t budge from its heading. Not only that, when heading into this chop it really shows how well all Smoker Craft Fishing Boats are. Something that they do that’s not commonly talked about is they inject foam into the hull of the boat during construction, after the floors have been installed. By injecting the foam into the hull after the floors, allows the foam to expand to every nook and cranny, giving you maximum coverage without and uneven spots where water can pool up. This increases the buoyancy of the boat and reduced hull noise and it was very much apparent during this run. 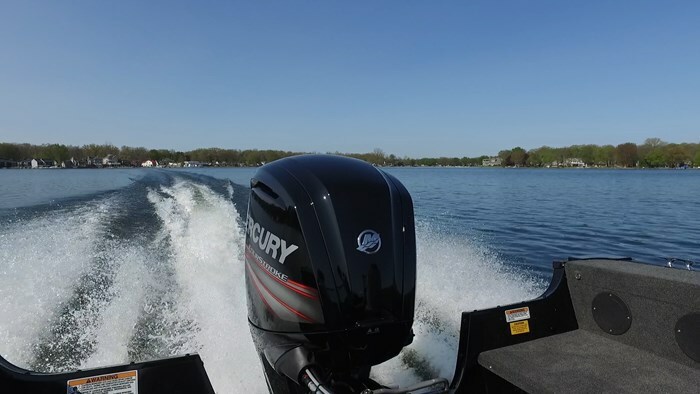 With a max horsepower rating of 140, the 90-hp Mercury Outboard that was rigged on the 172 might seem a little light, but every Smoker Craft is designed to run with less horsepower. The 90 had cruising speeds of 18.5 mph and 23.5 mph at 3000 and 3500 respectively. Pushing it to the limits I hit a top speed of 42.1 mph at 5800 rpm. These are great numbers because again, I had a light load in the boat. Add a couple people and some gear, full fuel tank and a full live-well and you’ll lose a bit off the top. 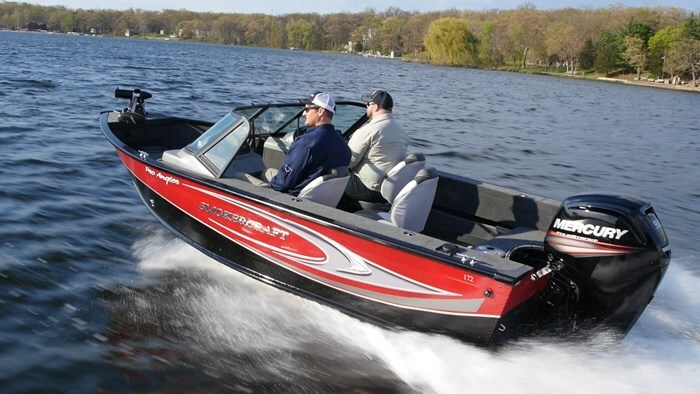 That said, if you’re on a budget, pairing this boat with a 70 or 75 wouldn’t be out of the question either to get you into a more than manageable price point. And at 1200 lbs dry weight you know that you won’t have to upgrade your vehicle either. When you find a formula that works it’s good to stick with it. The 172 is a proven performer and offers some of the best value in the 17-foot segment of the fishing boat market. It’s built to last, backed by a great warranty and when you buy a Smoker Craft, you’re immediately part of the First Family of Fishing.